Earlier this week I mentioned that my Halloween plans this year consist of an epic movie night with all the creepy classics. Easy, low stress, no pressure for an unbelievable creative yet financially reasonable costume. What’s not to like about that, amirite? 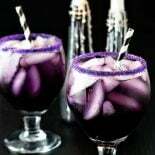 A festive purple people eater drink! Because being the wuss that I am, I’m going to need something to take the edge off when the scary movies start to play. Oh, would you just look at the condensation on that glass? And the deep purple hue? I’m a little partial to the sugar sprinkles, but once I was done eating those off the glass (no judging!) I found that the drink was equally as good. Of course, I’ve always been a fan of just about any drink that includes grenadine. I’m guessing that comes from my childhood, back when I thought I was A Pretty Big Deal at eight years old while I sipped on my shirley temple at dinner. As for the rest of the ingredients: sweet and sour mix is another classic staple to most of the drinks I like and Blue Curacao is a recent must-have liqueur I only discovered this year. If you haven’t already stocked up on it, I highly recommend you add a bottle to your liqueur cabinet! There seems to be an endless combination of drinks you can make with these 3 ingredients, and each of them taste a bit different depending on how much of each you use. Go ahead and have fun experimenting! Truth be told, I made this cocktail by throwing together some of the alcohol we still had in the house from last July. I’m not even sure if Purple People Eater is the “real” name for this drink, since I’m sure some clever bartender or self-proclaimed drink architect has thrown a concoction like this together before – but for right now, the name fits perfectly with my monster obsession this year. Because seriously, I’m not even kidding – everything this year seems to be monster monster monster for me. My friends should be glad I won’t be crashing any of their parties because I would totally embarrass them by showing up in an ill-fitting Sulley costume. Are there still rent-a-costume stores in the world? I mean, someone out there must still have a need for such a thing, right? I’m sure Google will help me out here. This can sometimes be a little confusing, but I’ve found the best way to think of it as this: Recipes that measure in parts usually mean it’s written so that you can adjust the size of the drink to whatever you want and the measurements they give you (1 part, 1/2 part, etc) are so you can keep the ratio of the ingredients correct. This recipe calls for cranberry juice, and if you use it, the drink may turn out a tad more maroon than purple. If you’re okay with sacrificing a bit of the intended taste for a better color, you can either substitute cranberry juice with cran-grape juice or grape juice OR double the amount of blue curacao used. Make a test drink first to be sure you still like the taste with these adjustments! Like the mason jar cocktail shaker used in the recipe video? You can get a near identical one here: Mason Jar and Stainless Steel Cocktail Shaker Set. And if you already have a ton of mason jars and just need a cocktail shaker lid, you can pick one up here: Mason Jar Cocktail Shaker Lid. Or maybe you like the glasses it’s served in? You can get a similar set here: Stemmed Beer Glasses. And don’t forget the black and white striped straws! Love the color purple? Then you’re going to go crazy for Black Magic Sangria and Naked Purple Ombre Cake! A tasty (and creepy!) cocktail that gets its purple hue from blue curacao, grenadine, and cranberry juice. A perfect cocktail for any type of party! On a small plate, add purple sugar. Wet the rim of a glass with simple syrup (or cranberry juice or just water) and gently dab the top the glass in the purple sugar, coating the rim. See above video for example. Set glass aside. Hey. I made this for a small party. We did Vodva. Blue Curarco and cranberry juice. Over ice. Topped with Sprite and lemon wedges. It was a great purple color which was the color theme of party. Everyone loved. I think I was calling it “Purple Rain”. 😆. Thanks great recipe.